A hydrographic education programme has been offered in Hamburg for more than 30 years. The programme was first offered in 1985 as an addition to an existing programme in general surveying, and the course became fully recognised as a Category A programme by the IHO in 1990. The Hydrography programme has been integrated as a specialisation in the two-year MSc in Geodesy and Geoinformatics at HafenCity University since 2009. In March 2017, the current programme was re-recognised as one of the first against the new standard S-5A. With the new recognition in place, the programme has shown that it is not at a standstill, but continually developing with new research projects and a new inshore survey vessel. Hydrographic education in Hamburg started in 1985 at the Hamburg University of Applied Science (HUAS) with three additional semesters of Hydrography and one practical semester to the existing surveying programme of six semesters. After completing the five years, the students received a diploma in ’Vermessungswesen und Hydrographie’ (Surveying Engineering and Hydrography). In 1990, the programme was first recognised by the FIG/IHO/ICA International Board on Standard of Competence for Hydrographic Surveyors and Nautical Cartographers (IBCS) as a Category A programme with ’Specialisation in Nautical Charting’. In 2000, a new curriculum was established introducing the ‘Hydrography’ Master’s programme that is taught in English. The MSc degree could be completed in a total of five years (including the Bachelor degree). In January 2006, HafenCity University (HCU) was founded by the Free and Hanseatic City of Hamburg, merging four departments from three state-owned universities (HUAS, Technical University Hamburg-Harburg, and University of Fine Arts). HCU brings all the areas of study and research needed for the ‘built environment’ together under one roof. Apart from an MSc in Geodesy and Geoinformatics (of which hydrography is a specialization) the following programmes are also offered at HCU: Architecture, Civil Engineering, Urban Planning, Metropolitan Culture, Urban Design, and Resource Efficiency in Architecture and Planning (REAP). HCU aims to improve interdisciplinary innovation in teaching, research and development of all building and planning related disciplines. In 2014, the HCU moved to its new building in Hamburg. In January 2018, the university had a total of 2397 students, 50 professors and 112 research and teaching associates. The MSc in Geodesy and Geoinformatics offers three specialisations: Geodetic Measurement Technology, Geographical Information Technology, and Hydrography. The courses are taught in English and as modules (Figure 1). They consist of compulsory and optional modules in the first three semesters followed by a Master’s thesis in the final fourth semester. The modules of each semester add up to 30 European credit transfer system points (ECTS), with an average 27 study hours each, resulting in an overall workload for the students of 120 ECTS for the entire 2-year programme. The interdisciplinary approach of the HCU is reflected in the programme structure. Some courses are taught together with the other specialisations of the Geodesy and Geoinformatics programme (e.g. Terrestrial Laser Scanning, Geo-Information Science, or Integrated Navigation). In the same way, all students of the Master’s programme must enrol in an introductory lecture on Hydrography in the first semester to gain a basic understanding of Hydrography. Interdisciplinary and transdisciplinary topics are also an option offered in the Interdisciplinary Project in the third semester at the interface of various education programmes. Within these modules, the students of different programmes work together to gain an insight into the research methods of other disciplines and improve their communication skills within an interdisciplinary team. The Project Management lecture, as part of the BASICS course, conveys competencies and soft skills that enable students to use and critically examine classical project management instruments. The hydrographic modules include exercises and practical courses (Figure 2), which give students the opportunity to apply the previously gained theoretical knowledge within a practical environment. In the third semester, the final field project (Supplementary Field Training) takes place, where students carry out complex hydrographic projects in small groups. The individual project tasks vary slightly from year to year, but always include the following components: project planning, preparation, data-acquisition, processing and evaluation of the system performance. Figure 2: Students during practical courses and the final field training. Most of the systems and vessels currently used for the practical exercises belong to government authorities or institutes. However, a new survey vessel is under construction (Figure 3). The vessel will have a length of about 8m and a width of 2.5m so that it can be trailered to waters of interest. 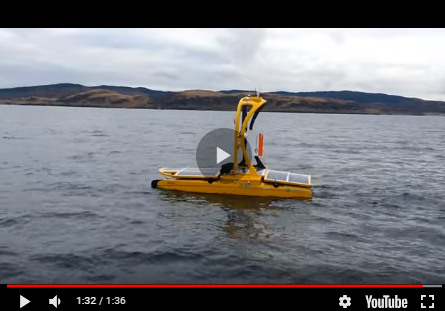 The vessel will be optimised for shallow-water applications and will be equipped with a state of the art multibeam and single beam echo sounder, a sub-bottom profiler, side-scan sonar, magnetometer, inertial navigation system and GNSS positioning. These systems will be modular so that they can be easily installed and exchanged depending on the task of a practical training or research topic. Borrowed equipment for detailed investigation or specific tasks can also be easily integrated into the vessel system. There will be space for up to four students in the cabin. In addition to practical training sessions for the students, the survey vessel will also be used for research purposes. Further to the new survey vessel with its high-end hydrographic equipment, some low-cost systems (e.g. single frequency single beam echo sounders, fishfinders) are owned by the HCU. The university also owns an OpenROV, which is a small scale, open source ROV assembled by students and used for various projects. HCU closely cooperates with different institutes and authorities dealing with Hydrography or Bathymetry, such as the Hydrographic Agency of Germany (BSH), the Alfred Wegener Institute (AWI), the Hamburg Port Authority (HPA) and various companies. The students have the opportunity to get internships or write their thesis in cooperation with these partners. As an example of such a partner project, HCU, in collaboration with the German newspaper WELT, developed dynamic and interactive 3D views and videos of the River Elbe for public information purposes in news media. These have been integrated into a multimedia special that aims to give people better insight into the complex topic of the fairway adjustment of the Elbe. Recently, HCU has been contracted by the BGR (Bundesanstalt für Geowissenschaften und Rohstoffe / Federal Institute for Geoscience and Natural Resources) in the INDEX2017 (Indian Ocean Exploration) project. The project deals with marine resource assessment in the German licence area in the Indian Ocean. In addition to supporting the BGR during data-acquisition on the SO259 INDEX2017 cruise of the German research vessel Sonne, the HCU focuses on processing, analysing and investigating the data collected with the deep-towed bathymetry sled HOMESIDE and the ship-based multibeam echo sounder data. Figure 3: Draft of HCU’s planned survey vessel. Applicants for the Master’s course must have completed a Bachelor’s or Diploma degree in Hydrography, Geodesy and Geoinformatics, Geomatics, or a related geo-scientific technical or engineering-oriented degree programme. A satisfactory score on the Bachelor’s examination is required. Applicants whose first language is not English must provide evidence of their English languageability. The programme starts every October. The number of students is limited to a total of 16. The number of first-year students within the Hydrography specialisation varied between eight and fifteen over the last few years. A total of 42 students from 21 different countries (in October 2016) are enrolled in the programme.